This content is brought to you by Thomas Built Buses. Many fleets have been eyeing propane-fueled vehicles over the past few years as viable alternatives to their aging diesel-powered buses. Tighter transportation budgets, paired with after-treatment maintenance issues, have caused school bus fleet managers to rethink diesel. They are looking for alternatives that are more cost-effective, cleaner and easier to maintain. In a recent School Transportation News survey, 13 percent of respondents reported purchasing new propane school buses, up slightly from 12 percent two years ago. But now it seems that districts are eyeing a new “alternative”—gasoline. While not technically an alternative fuel, gasoline is touted for its lower cost, ease of maintenance, and accessibility across the country, compared to propane. Like clean-diesel, gasoline is more accessible across the U.S. and Canada for fueling that takes place outside of the bus yard. From field trips to extracurricular travel, transportation managers don’t need to plan the route based on fuel availability, as they would for propane. On top of that, fleets report spending less money upfront on acquiring gasoline-powered school buses and less on the fuel itself. But, some argue that gasoline school buses may be too good to be true. Fuel economy is one of the key misleading indicators when it comes to costing-out a gasoline school bus. While gasoline cost per gallon is typically lower than that of clean-diesel, the cost of the fuel is less stable and less efficient, compared to diesel. Unlike gasoline, diesel prices tend to remain more stable throughout the year, which provides fleet managers with more control of their budget from one month to the next. Plus, diesel engines are significantly more efficient than gasoline engines, which means better fuel economy and increased fuel savings. On average, a clean-diesel school bus can travel around 510 miles on a tank of diesel vs. only 270 miles on gasoline, based on the same, standard-sized fuel tanks. Newer engines, like the Detroit™ DD5™ and DD8™ diesel engines, are even showing an additional 3 percent increase in fuel efficiency. This difference in range and fuel economy quickly mitigates the cost difference between gasoline and diesel fuel. Ease of maintenance is another huge consideration when switching to alternative fuels. Many districts are touting easier maintenance and greater technician availability, when it comes to repairing gasoline engines. While more technicians are indeed familiar with gasoline engines, experts argue that the ease of school bus engine maintenance for all engine types has improved over the years. Today, newer engines like the DD5 and DD8, dramatically ease maintenance with some of the longest service intervals in their class. In addition, remote diagnostic services provide an extra layer of support for constrained shops that have limited technician bandwidth. The Saf-T-Liner© C2 school bus, available from Thomas Built Buses. At one time a pain point for technicians, after-treatment systems are also no longer the headaches they used to be. Now, through state-of-the-art variable cam-phasing technology that is available through Detroit™, and the Stay Warm feature, which is available through Cummins, new clean-diesel after-treatment systems allow additional heat to enter the exhaust stream. That enables efficient operation of the after-treatment system in low-speed, stop-and-go operations. Yet another factor that is often not being considered is engine life. Gasoline engines, like other alternative fuel engines, aren’t built from the ground up for the medium-duty market. Over the long haul, newer diesel engines will last 15-20 years in a fleet, while a gasoline engine may need to be replaced once or even twice during the life of a school bus. “All of these are important for fleet managers to stop and consider when choosing a new school bus,” says Hedgecock. “It’s understandable that fleet managers want to run to something better for their next school bus purchase. But better doesn’t always mean different. 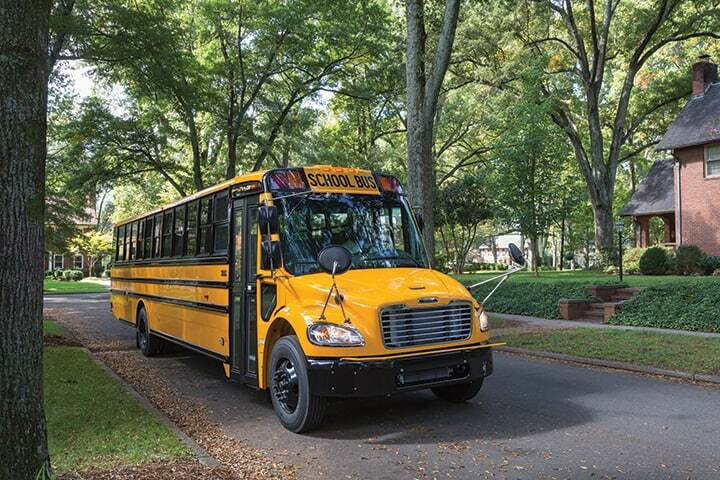 With the revolutionary improvements that we’ve seen in the diesel engine in just the past two to three years, fleet managers no longer need to move to a different fuel type to experience more reliable, cost-effective school buses. Many fleet managers today are realizing significant cost reductions and ease of maintenance with newer clean-diesel school buses,” he noted. So how does a district choose the best engine type for its fleet? Talking with your local dealer and others in the industry are great places to start.